Seeing one Roach often means there are many more you are not seeing. If you are seeing a Roach during the day, this could mean there is an overcrowding and that is the reason you saw the one or few. They are very tricky when entering your home or business, able to enter through vents, sewers pipes, cracks and crevices. What is even more credible is how they enter on your bags, clothes, boxes, or on you. 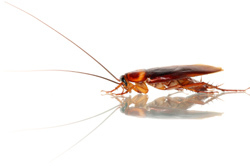 Roaches incredible rate of reproduction make them a nasty pest to get rid of. Killing a few pests gives time for many more to be born! Your home or business are perfect habitats for Roaches, being warm and containing food water and nesting sites. This is a lethal combination when trying to get rid of Roaches. Another defense mechanism these pests have is there eggs are naturally protected from insecticides. This makes it hard for do-it-yourself treatments to be effective. They also are really good at hiding, making control seem impossible! At Eco Tech we are well trained in the know-how for Roach pest control. We have the necessary equipment and materials, and have been dealing with these pests around the Twin Cities for 15 years. We know how to get your home or business pest free, using our less toxic organic pest treatment; the way it should be.